There are three different mines in Animal Parade. Two of them are in Garmon Mountain, and the third is in Harmonica Town. Each of the mines have different colored Wonderfuls that are specific to that mine. Garmon Lower Mine is the first one you'll unlock. On the 10th floor of the mine you'll discover Alan's Red Bell. The mine is 30 floors deep and you can access the whole thing after you chime the Red Bell. On the 30th floor you'll find a lava room with an invisible Power Berry in the corner. There is a hot spring on floor 20, but you have to go past the staircase that leads to floor 21 and then down the hallway. Garmon Upper Mine is next to the entrance to the lower mine, but it leads up the mountain instead of down. You can access this mine after the Red Bell has been chimed. 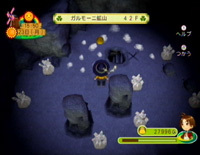 The mine leads you to the seat of the Harvest King, where you can find another Power Berry to the left of the King's platform. The upper mine is 45 floors high. The hot spring for this mine is all the way up on floor 45. Watery Cave becomes unlocked as you work on ringing Ben's Blue Bell. The cave is protected by the Aqueduct Key, which you can get from Paolo as you work through the steps needed to ring the bell. Watery Cave is 50 floors deep, and on the bottom floor you can find a large pool of water to fish in. There is a hot spring on floor 20. To find the goodies inside the mine, you will have to use your Hammer to smash the ore rocks and jewel crystals. The mines also hold plain rocks, which you can smash to get Material Stone for building upgrades. The chances of finding a jewel or ore inside of the rocks is completely random, and there doesn't appear to be any better success rates the further you go into the mines. Not everything is hidden within rocks. 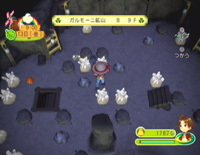 You can pick up various mushrooms on every floor of the mines, and some floors are more plentiful than others. Check out floor 22 of the Garmon Lower Mine, 12, 26, and 36 of Garmon Upper Mine, and floors 19, 29, and 43 of the Watery Cave. You'll find plenty of mushrooms for shipping. The mines also have a little Mole that digs around and occasionally pops its head up. If you hear a strange "whomp whomp" noise as you are exploring the mines, then that is probably a Mole. When the creature pops up you can whack it on the head with your hammer. The Mole will scurry away and leave behind items like Mushrooms, Toadstools, Pontata Root, Bodigizer XL, and Stamina Drink. Once you have your collection of unrefined ores and jewels, visit the Koto Accessories shop in Garmon Mine district. Talk to Mira and ask her to process your new treasures. She will charge 35 G for each one, and the success of finding something worthwhile is completely random! You might end up giving her 8 pieces of Gold Ore and receiving 8 pieces of Junk in return. As you smash the rocks and crystals with your hammer, you will release gasses that spread out around the room. Some of these gasses are beneficial, and some are not so helpful. There's no way to know what color of gas you'll release when you smash something. The affect of the gas will wear off when you move to the next floor in the mine. Red = poison: Loose between 20 and 50 stamina. Orange = darkness: The amount of light is reduced to a small circle around your character. If you get hit by another gas, this one cancels out. Yellow = sickness: This gas will either cause you to get sleepy or catch a cold, which means you'll loose more stamina when using use tools. Cure the cold with Cold Medicine from Harp Clinic, and simply go to bed to cure sleepiness. Green = recover: Regain between 10% and 30% of your stamina. Blue = power up: You will not loose any stamina if you use your tools. Purple = reverse: The controls will randomly change the way you move your character. If pressing up on your analog stick moved your character north, the purple gas may flip to left being the new "north", up becomes "east", etc. White = speed: There are two types of white gas. The slow-moving white gas causes your character to slow down when walking, and the fast-moving white gas will speed up your walk speed. When you smash large groups of rocks at once, you may end up with a lot of gas being released. The first gas that hits you will be in affect, and the others will typically pass you by. Junk 10 G Processed from all ores. Iron 50 G Processed from Iron Ore.
Copper 70 G Processed from Copper Ore.
Silver 100 G Processed from Silver Ore.
Gold 150 G Processed from Gold Ore.
Rare Metal 240 G Processed from Rare Ore.
Lapis Lazuli 300 G Processed from Blue Wonderful. Aquamarine 420 G Processed from Blue Wonderful. Sapphire 620 G Processed from Blue Wonderful. Ruby 830 G Processed from Red Wonderful. Jade 190 G Processed from Green Wonderful. Peridot 350 G Processed from Green Wonderful. Emerald 690 G Processed from Green Wonderful. Crystal 170 G Processed from White Wonderful. Opal 330 G Processed from White Wonderful. Diamond 1330 G Processed from White Wonderful. Amber 250 G Processed from Yellow Wonderful. Topaz 550 G Processed from Yellow Wonderful. Spinel 220 G Processed from Purple Wonderful. Amethyst 420 G Processed from Purple Wonderful. Glass 10 G Processed from any color Wonderful. Pearl 90 G On the ground only in Watery Cave. Black Pearl 150 G On the ground (floor 25, 44, 49) only in Watery Cave.